The Papakura Local Board has its monthly business meeting tomorrow. As always you can see the full agenda HERE. 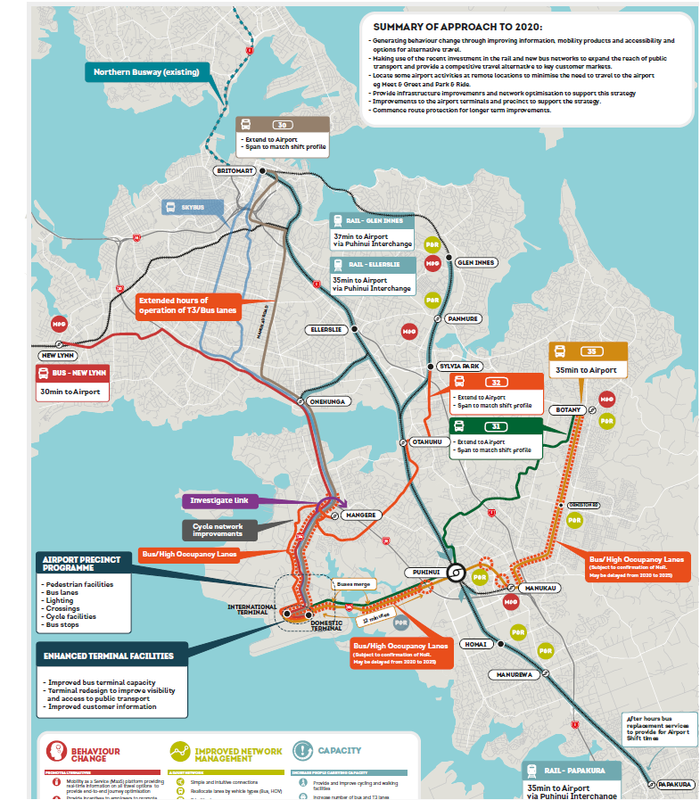 Looking at the Auckland Transport update there is two large items showing up in this month’s agenda, one being the McLennan Park Pathways and the other being the Great South Road Transit/Bus Lanes. Airport to Botany Rapid Transit (A2B) is also beginning to show up in the Southern Local Boards’ agendas as that piece of work (aka the Southern Airport Line) gets under way which when complete will allow those in Papakura to reach the Airport in 35mins bypassing Southern Motorway and State Highway 20B traffic. To progress the allocation of the remaining Auckland Transport Local Board Transport Capital Fund (LBTCF). Local boards can use the LBTCF to deliver transport infrastructure projects that are not part of Auckland Transport’s work programme.There is $646,606 in the Papakura Local Board’s LBTCF which needs to be allocated by end of the electoral term. This report recommends further allocation of the LBTCF to help to complete a larger range of pathway links within McLennan Park. The pathway links were recommended through the concept plan for McLennan Park developed by Auckland Council Community Facilities department. a) allocate $397,000 from the Auckland Transport Local Board Transport Capital Fund to construct sections of shared path noted as 1 & 2 of the McLennan Park Concept Plan for a 3m wide shared path linking the new roads to the north of the park to Artillery Drive. be in the road corridor (although projects running through parks can be considered if there is a transport outcome. Through the Long-term Plan, local boards have had an increase in available funding for their Local Board Transport Capital Fund. This has effectively doubled, with the total funding available to all 21 local boards now $20.8m per annum. The allocation for the Papakura Local Board, has now increased with the updated figures for the remainder of his electoral term reflected in table 1 below. The table below reflects the status of projects to which the LBTCF has already been committed. There is currently $646,606 remaining in the Papakura LBTCF. This has to be spent by 30 June 2019. The local board requested Auckland Transport staff to investigate whether their LBTCF can fund sections of the pathway network proposed in the concept plan for McLennan Park. In particular, AT were asked to look at those sections, which could connect road to road, thereby meet the criteria for LBTCF projects. Developing 2 x 3m wide shared pathways between new roads to the north of McLennan Park to the existing road – Artillery Drive to the south. McLennan Park has been an important and integral sports reserve in Papakura since 1947 when the McLennan family gifted the land to the City of Papakura. The reserve currently comprises two parcels of land totalling approximately 17.89 ha. The park has provision for three football fields and two cricket pitches. Whilst the football and cricket clubs share the fields, they both currently have separate club rooms and associated facilities. Development of a medium to high density residential development is ongoing to the north of the reserve. As part of the proposed development, a land swap along the reserve’s northern boundary was negotiated. This additional land provides space to accommodate new football fields and other facilities within the reserve. The ongoing design development of the reserve should be undertaken in conjunction with the detailed design of the adjacent development to ensure that the neighbouring residential areas and the reserve are better integrated in the final constructed outcome. In terms of linkages to wider walking and cycling network, McLennan Park also features in the Papakura Greenways – Local Path Plans approved in 2016, which specifies priority pathways that link the park to the surrounding areas both to the North and East. The local board has discussed the allocation of its local board capital fund for the development of the footpath network within McLennan Park with Auckland Council’s Community Facilities department. It was noted in the recommendations from the McLennan Park concept plan that two of the proposed pathways were links between Auckland Transport controlled roads – new roads to the north of the park and Artillery road to the south. Staff were asked to investigate whether funding from their LBTCF could be used to fund the road to road links, shown in Map 1:Shared Paths proposed to be funded through the Papakura LBTCF (identified as Shared Pathway 1 & 2). Staff confirmed that the board could allocate LBTCF for the project. 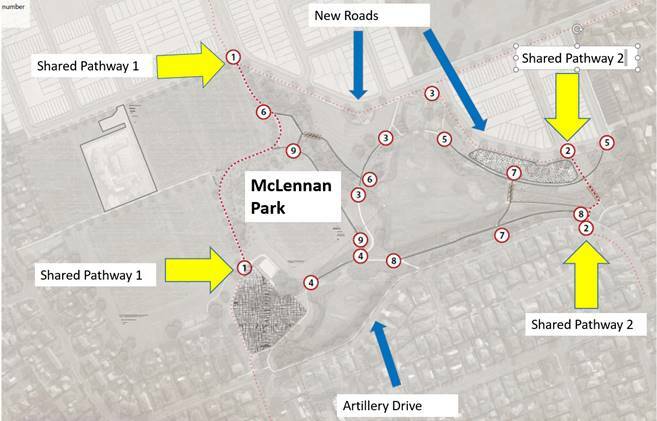 A combined workshop with AC and AT staff was held with the local board in July 2018 to propose a collaborative staged approach for the development of pathways within McLennan Park. The board directed that AT and AC confirm funding allocations and seek formal local board approval. Delivery of this project is subject to earthworks being undertaken by AC Community Facilities to contour the site. AC Community Facilities are currently working through the process of obtaining resource consent and funding to complete those works. Local board views were incorporated in investigation and development of the planning for the delivery of this project. Local board plan outcomes are one of the criteria against which potential projects are assessed against and this project was assessed positively against the plan. Local boards will continue to be engaged with LBTCF projects as they progress via Auckland Transport’s Local Board Monthly Update reports. Any engagement with, or impact on, local communities will be assessed on a project by project basis. Sub-regional and regional impact will also be assessed on a project by project basis. Any engagement with, or impact on, Māori will be assessed on a project by project basis. The financial implication of the board approving recommendations a) of this report is the allocation of $397,000 of the LBTCF. This leaves $249,000 remaining in the fund. 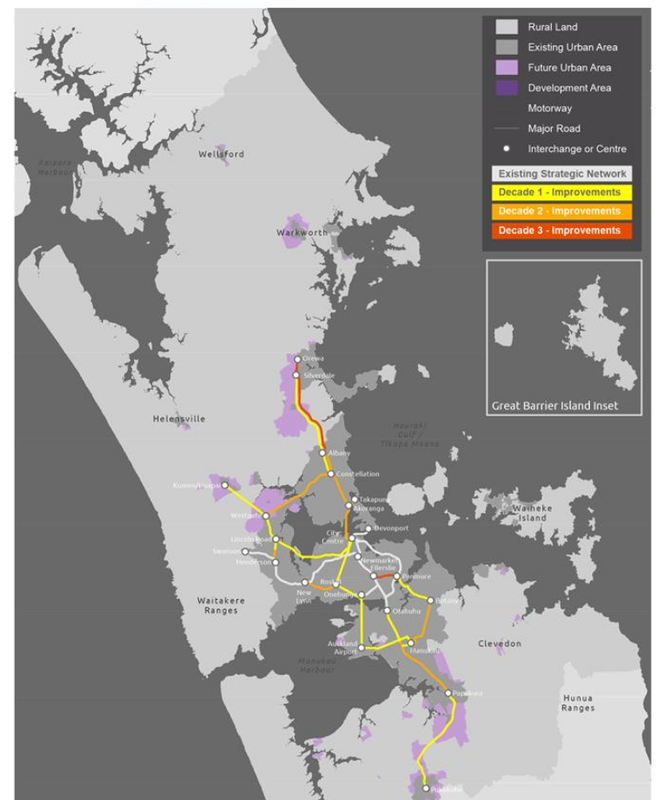 Auckland Transport will put risk management strategies in place on a project by project basis. This delivery of the two specified footpaths are subject to earthworks by AC Community Facilities for contouring of the site. Delays in earthworks may impact on the timeline for delivery of the two footpaths. Auckland Transport will progress the decisions made by the local board as a result of this report and provide updates via the monthly reporting process. If it becomes clear that there is a risk of underspend of the LBTCF within this electoral term, Auckland Transport will make further recommendations to the board at a future business meeting using the agreed criteria. To update the Papakura Local Board on transport related matters in its area. Auckland Transport has a number of projects in progress in the local area,including the Takanini Park and Ride, Takanini Platform Upgrades and lighting upgrades for Papakura Town Centre. Auckland Transport is investigating car parking issues in and around Papakura Town Centre, a walkway in Central Park for commuters from the train station, lighting upgrades for the car park and walkway between Great South Road and East Street and Papakura Station Access project. a) receive the Auckland Transport August 2018 update report. This report addresses transport related matters in the local board area. A separate report on the agenda provides information and requests a decision on the Local Board Transport Capital Fund (LBTCF). At the request of the local board, Auckland Transport will include the quality and visibility of disability parking in the Papakura town centre business area as part of the upcoming parking survey and consultation as part of that review. The board’s request for Auckland Transport to support a public meeting regarding the planned traffic light at Bellfield Road and Great South Road has been referred to Auckland Council. The signalisation of the intersection is a requirement of the consent that was granted through the Special Housing Area legislation for the subdivision. As the lead agency in the granting of the consent, this has been referred to the Resource Consents Team Auckland Council to respond to. The local board’s feedback regarding the provision of T2/3 lanes on Great South Road as a priority has been noted and referred to the relevant project team within Auckland Transport for consideration. Councillor Newman has met with AT senior management staff to discuss the elected members’ concerns and preference for T2/3 facilities for Great South Road, Takanini rather than a bus-only lane. A date for the local board to present to the AT Board is still to be confirmed. Attached for the board’s information is a summary of Auckland Transport’s activities over the past quarter in the local board area as well as regionally. Attachment A isAuckland Transport activities in the Papakura Local Board area and regionally for the April – June 2018 quarter. Attachment B is Travelwise Schools activities in the Papakura Local Board area for the April – June 2018 quarter. This section provides a regular report about how Auckland Transport (AT) is supporting the Papakura Local Board’s Advocacy Initiatives as recorded in the Papakura Local Board Plan. The board’s Advocacy Initiatives from the 2016-19 term are recorded in the table below. Papakura’s cycleway and walkways provide safe, connected alternative routes to get us to where we need to go. Begin implementation of the Papakura Greenways Local Paths Plan and Cycleway Plan. Through the LBTCF, AT is currently supporting the delivery of Project 12 &13 of the Papakura Greenways Plan. Establish safe, clear, walk and cycle links between key facilities. AT is currently in the process of delivering the Safer Communities project, which aims to improve walking links in Papakura focusing on the Papakura Train Station. Improve, through AT, pathway safety including lighting and accessibility. AT is currently upgrading street-lighting within the Papakura Town Centre to improve safety. 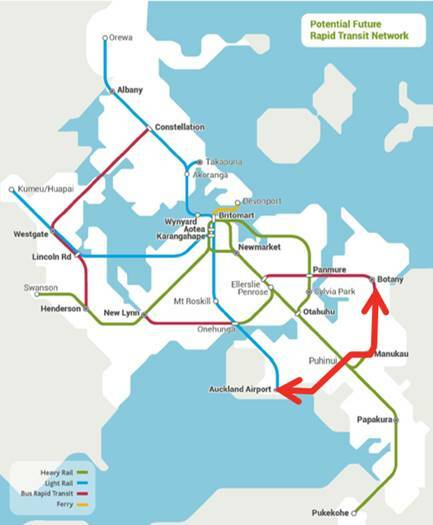 A key part of AT’s public strategy is to provide an east-west Rapid Transit Network that links Auckland Airport with Botany via Manukau. This project will involve New Zealand Transport Agency, Auckland Airport and AT working together over a number of years to plan and build a bus or light rail link between these points. At this early stage of planning there are not many details but there are likely to be many potential benefits for South Auckland. Faster and more reliable public transport between Papakura, Botany, Manukau and the Airport will make commuting east-west across Auckland to employment hubs at the Airport or East Tamaki easier and provide more options for air travelers. For the Papakura area, the project will improve connectivity by allowing better access from Papakura and Takanini to transport hubs in Puhinui and Manukau. At these hubs, travelers will be able to join the rail network for north-south journeys. The thick red line in Figure 1 shows the approximate route and how it will link with existing and planned Rapid Transit Networks. The project team has recently started discussing this plan with local boards and councillors and over time, the public will get opportunities to discuss the plan. An upgrade to the Takanini and Te Mahia train stations began on the 30 March 2018. The works to the Takanini station include a change to the profile of the platform to improve drainage and preparation for the new foundations, and new lighting and CCTV with subsequent works to install standard shelters, which will bring the station into alignment with other stations on the network. In Takanini, resurfacing of the platform is to be undertaken in early August where they will strip the existing surfacing and re-profile. Installation of the shelters is planned to start on the 1 September with completion now expected in January 2019. AT is currently nearing the completion of a region-wide programme to install electronic ticket gates at selected stations on the rail network including Papakura station. This work was initially delayed but has now been resolved and work completed at the Papatoetoe Station in July 2018. This project is included in the Auckland RLTP (2018-2028), with $12 million allocated for the Park and Ride in years 2018-2020, and a further $6 million identified for the bus station interchange development which is currently unfunded. In May, this project was reported to the AT’s Capital Review Committee, who confirmed the proposed approach to move the Papakura park & ride and bus station extension projects to a single stage business case (SSBC). This will look at issues for all access modes to the Papakura Station. AT has procured the professional services of Aurecon to complete a SSBC for Papakura Rail Station Access. A final recommendation for a preferred capital work program option, which will allow AT to seek NZTA funding for final design/ construction, is expected by the end of December 2018. A workshop with the local board was held in July to update the local board on the progress of this project. In early 2017, Pararekau Road in the Hingaia Peninsula was subject to development works by developers in the road corridor for installation of underground utilities. The work was originally delayed and impacted on a second set of works on Pararekau Road which was unable to be completed until the construction period in late 2017/ early 2018. This resulted in Pararekau Road being subject to traffic management for most of 2017 and the first quarter of 2018. Those works resulted in damage to the road surface along Pararekau Road, which has been a concern to local residents. Work by the contractors was completed in April 2018, and they were required to reinstate the road to its original condition or better. This requirement was originally challenged by the contractors/ developers resulting in delays in reinstating the road. The developer/contractor was issued a non-compliance notice on 1 June 2018 and given until mid-July before further action would be taken. Since then, the contractors/ developers have requested a time extension to develop options for the reinstatement of the road, which will be reviewed by AT prior to approval. As part of improving Auckland’s public transport network system, a bus/T2/3 lane is proposed for Great South Road, Takanini to allow greater efficiency for the bus network. An update on this project was provided to the local board in a workshop in October 2017, where the local board was presented with a number of options. At that workshop, the local board also advocated for the development of an off-road shared path to replace to removal of the on-road cycle facility. Currently, the Bus Priority project is progressing and delivering several projects for bus route 33 along Great South Road. The proposal for the Takanini section is a proposed new bus or transit lanes on both sides of the road between Manuroa Road and Una Street. A workshop was held on the 25 July where the local board was briefed on the status of the project and were given the opportunity to provide feedback. The local board’s position was reflected in resolutions in July, which are responded to in paragraps 10-12 above. The land adjacent to Takanini Station has for the past few years, been used as an informal park and ride. This land was owned by Land Information New Zealand and through last year, was in the process of being transferred to KiwiRail. Detail design was delayed and now programmed for completed with a contract going for tender this month followed by construction in early October. Works are expected to be completed before Christmas 2018. Community consultation was in October 2017 and has been used to develop a priority list of projects to improve the ‘walkability’ in and around the Papakura Town Centre. This included local board views via local board plans. Analysis of the community feedback was undertaken earlier this year and has included targeted engagement with the Papakura Commercial Group and Integrated Area Plan team for Manurewa, Takanini and Papakura, the Park & Ride project team and Auckland Council Parks. Further engagement with the Papakura Commercial Group was also undertaken on the 11 July 2018. Following that meeting there was a request from elected members to form a focus group to provide feedback to the project to assist in prioritisation. Dates for meetings are in the process of being finalised. The result of this group was to be reported back to the local board prior to wider public engagement. After the next set of public consultation including a further workshop with the local board, a list of priority projects will be finalised and handed over for delivery to AT’s operational teams over the next 2 years. Lighting upgrades for Railway Street West, Wood Street and Ron Keats Drive have been completed. Further investigations into the lighting improvements into the walkway between Great South Road and East Street are currently being investigated with site visits completed and requests to the lighting team progressed. AT is currently undertaking investigation and preliminary design for the roundabout and a report to the LB with recommendations is due in September 2018. Accordingly, a comprehensive parking study is scheduled for Papakura Town Centre to be carried out between November 2018 to March 2019. Results from this study will be reported to the local board in April/May 2019 with recommendations to be implemented in the following financial year. As noted in the responses to resolution section, this study will include consideration of the local boards request to review the quality and visibility of disability parking in Papakura Town Centre. Through a request from the local board, AT and Auckland Council’s (AC) Community Facilities department are in the process of obtaining a ‘rough order of costs’ for the development of a pathway with associated lighting from Railway Street West through Central Park to King Edward Road in Papakura. Development at 135-143 Pararekau Road. Traffic Control Committee (TCC) decisions within the local board area are reported on a monthly basis. The decisions affecting the Papakura Local Board area in July are listed below in Table 4. My personal preference for the Great South Road is to have a T3 Transit Lane that allows the Fonterra Tankers to use it as well separating them out from general traffic. The lane would operate 7am to 7pm – 7 days a week given the 33 Bus and the tankers use the road frequently all day while traffic has a nasty tendency to back up at any given time of the day as well. That is all from the Papakura Local Board concerning transport for this month. Next one up next month!